We went underground today. 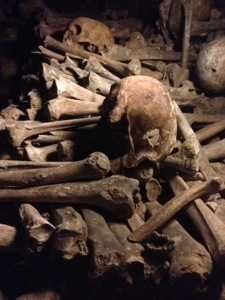 Underground tunnels full of human bones, what could be more kid friendly than that? 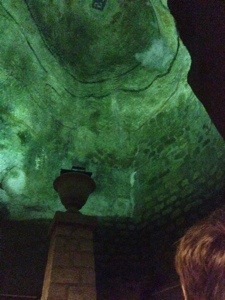 We had wanted to see some original catacombs in Rome, but ran out of time. So Paris is our last bone sighting chance. We managed to get out the door before ten am this morning, only to encounter a line. A line! We had to wait a whole forty five minutes. Apparently in the summer it would be more like four hours, we’re never going to be able to come back in the summer, unless it’s to eat pastries and icecream. We hired the English audio guide, being travel wise now, it’s always worth it. What a story it told. Paris, millions of years ago, was under the sea which means that if you’re a Roman looking for some decent stone to build your temples and baths out of in Paris, you just had to dig down ten or twenty metres to find as much excellent limestone as you want. Not only Romans, but everyone who came after them enlarged the underground quarries and helped themselves. This explained to us why the seven hundred year old gargoyles adorning the cathedral of Notre Dame have little seashells exposed in the weathered bits. Nobody really cared about managing the quarries, they’d just pop underground and carve out as much as they wanted. The inevitable happened in the late 1700s, a large chunk of street and houses in Montparnasse suddenly crashed into the abyss. This started happening fairly regularly, with one section of pavement dropping twenty five metres. You can imagine that at that time Louis XVI had a lot on his mind, but this was so urgent that he set up a Quarries Inspectorate to start stabilising the site. They’re still in operation today. 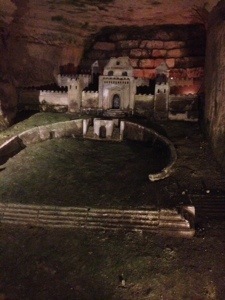 One of the workmen on this site spent his lunch hours carving out little models of a castle in which he’d been once imprisoned. The work proved so popular that he started carving out some steps so that visitors could access them. He didn’t finish the steps because the roof caved in and killed him. About ten years after the stabilisation works had begun, Paris had another problem. Its cemeteries were overflowing. They tried digging up some old bodies that nobody cared about and stacking them in charnel houses. This was a temporary solution that rather annoyed the householders around the charnel houses, with reports that fresh milk or soup would go off in a couple of hours and my dear, the smell!. And then the Cemetery of the Innocents started overflowing into peoples’ cellars, and that can’t have been pleasant. 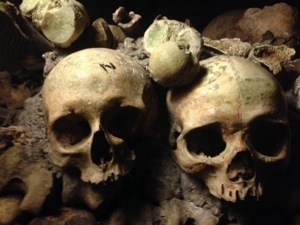 So there was a problem of a whole lot of dead bodies that nobody really cared about any more, and nearby there was a massive set of limestone tunnels deep underground. In 1786 parts of the quarries were blessed and the transfer of all of the bones in the Cemetery of the Innocents started, travelling by hearse preceded by priests in the dead of night. And here they are. 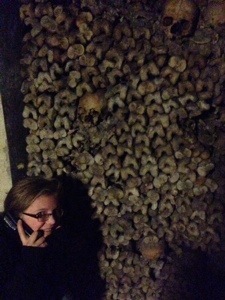 It’s estimated that there are the bones of six million Parisians down here. More cemeteries were emptied into here, the transfer didn’t stop until 1859. Almost none are marked or noted, but they are arranged very neatly. 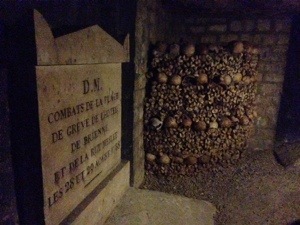 The bones of such luminaries as Rabelais and Pascal and Charles Perraut (author of Cinderella and Puss in Boots) are certainly in here somewhere. The effect is at first shocking, then a bit overwhelming, then it’s kind of nice that everyone’s in here all together. Very Socialist. There’s a little corner arrangement for a whole lot of bodies dumped on a street during the French Revolution. There are quite a few plaques around the place with deathly poetry in French and Latin. There’s a monument to a poet with one of his teen angst poems on it, about how life was futile and nobody loved him. He died suddenly in his twenties after being thrown from his horse, so never got the chance to burn that kind of thing. His bones aren’t behind the monument, they’re in with everyone else. Eventually we wend our way out of the bones and into some caverns with information signs about the rock formation and fossils that nobody reads. There is an example of the kind of rock formation that leads to cave ins, this one has been coated in concrete to stop it reaching up to street level. That’s the kind of thing for which the Quarry Inspectors are always on the lookout. Constant vigilance. It made a nice change from churches and museums. But I did pop into Notre Dame to get my book. We only had to wait in line for a couple of minutes, during which time I chatted to an Asian man who, after learning that I was from Australia, complimented me on my English. Tourists.